Sophsterlicious • UK Blog: Haul % Some More New Stuffs! Hey everyone, I thought I would do a haul post of the rest of the stuff I got the other day when I bought all my new LUSH goodies, Post here. I had a little birthday and christmas money I wanted to spend, so this is what else I got! In Boots I got the C2000 foundation (Shade Vanilla) and concealer (Fair), I used these for the first time today and so far so good, I will do a review once I have used it more. The botanicals make up remover is something that I have read so much good stuff about and was on buy one get one half price, So I picked up two and the Soap and Glory mitt is something I read about on another blog, and it looked interesting, So I am gonna try that out soon! Next up, the Urban Decay Hall Of Fame Boxset, I had looked at this online a few times a while ago and thought it looked nice, and when I was in Boots I needed to pick up a new UDPP which is £11, this set was only £18 and the UDPP is an Extra Large one, and you get all the extras, So I went for that! In Superdrug I browsed the Collection 2000 section, I knew I wanted a couple more of the glitter liners, which are fab! (Review Soon). They are so packed full of gorgeous colourful sprakle! .. I couldn't help but take advantage of the nail polishes on offer for 3 for £5, So I picked up the colours I have had my eye on for a while now. 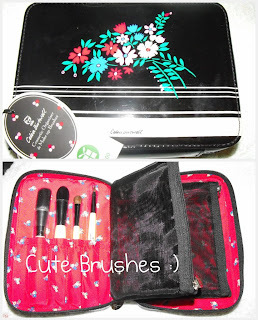 Lastly, In the Boots sale I spotted this cute little Celia Birtwell case with four brushes in, I have her Kabuki and think it is fabulous, So was keen on trying more of her brushes, and these all look really nice, and the cute case will come in handy when I am traveling for taking make up in. Best of all, it was reduced from £12 to £6. I also bought some new clothes in Evans and New Look, but haven't photographed them, I got some cute tops and new trousers and a nightdress. I still have a little money left, which I am going to spend online. I'll show you what I ordered when I get round to ordering it and have received it. I still plan on doing my Christmas and Birthday Pressie post too, if people are interested? Ohh I love Button Moon nail varnish, IMO better than any of the other pastel minty green colours out there. I loove collection 2000 hot looks nail polishes. Couture looks like a lovely colour, I'll have to get that one next! Yay for soap and glory! I have the small silver bow earrings and they are probably my most worn. got the bow earings too, coulkdn't belive they were so cheap! :) I got another pair of bow earings but they were coloured. I really want to try the mit, apparently it's good for getting that glow back into your skin, might hold off buying it till you review it! !